Ryan had a very good season this year recording five first places. He won his league meet, the MVC, in 16:20.10. 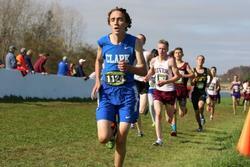 He then followed that up with his fastest time of the year in 15:54.24 in winning the DII boys VOA district race. He was second at the Troy DII regional in 16:14.74. Finally he finished his season by coming in 9th at the OHSAA DII state meet in 16:0760. In the photo above, he is shown finishing at the state meet.